When you have lived and worked in the same town for so many years sometimes you can feel like a break. Though, finances can be tight and lets be honest you have likely explored most the accessible locations around you. This was the exact predicament I was in. Taupo, located smack bang in the middle of the North Island in New Zealand is where I call home most of the time. I have lived here since I was 12, driving the same roads everyday. For god sake, I have lived in five different houses in a one kilometer radius! Life gets boring and sometime you need a small break to refresh yourself. Checking out my options online I decided to book somewhere I always have wanted to visit though never knew was actually possible, White Island. 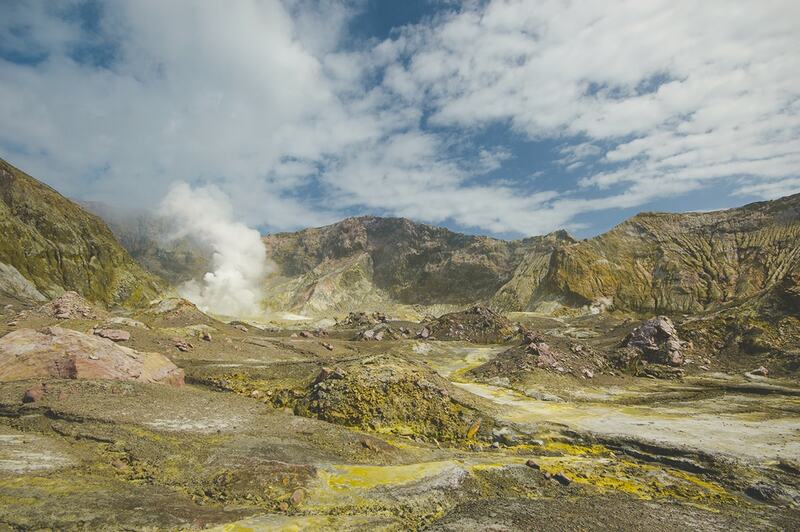 White Island, also known as Whakaari by its shorten Maori name, is New Zealand’s most active cone volcano. The island is part of a submarine mountain that rises 1600 meters from the surrounding seafloor. It is located 48 kilometers from the east coast of the North Island with the closest towns being Whakatane and Tauranga. Back in the day sulfur mining was attempted here, though due to a lahar incident in 1914 which killed all workers, production was stopped. 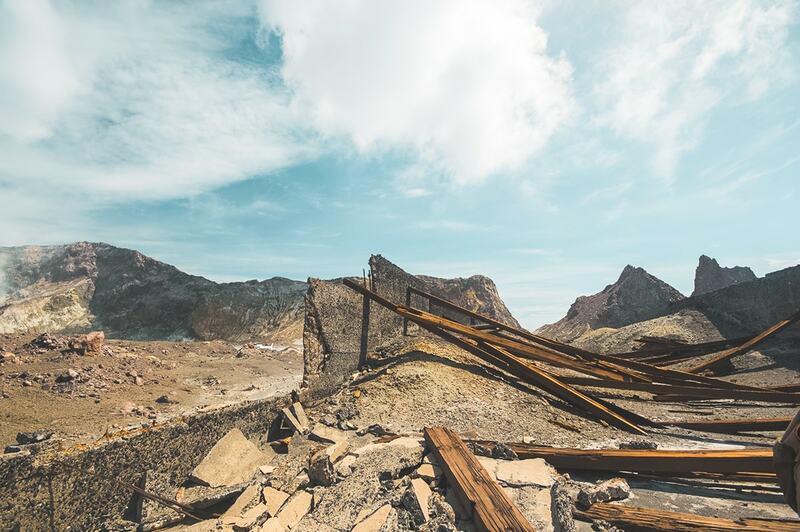 The remains of the buildings are still standing, though seriously worn overtimes from the harsh environment. 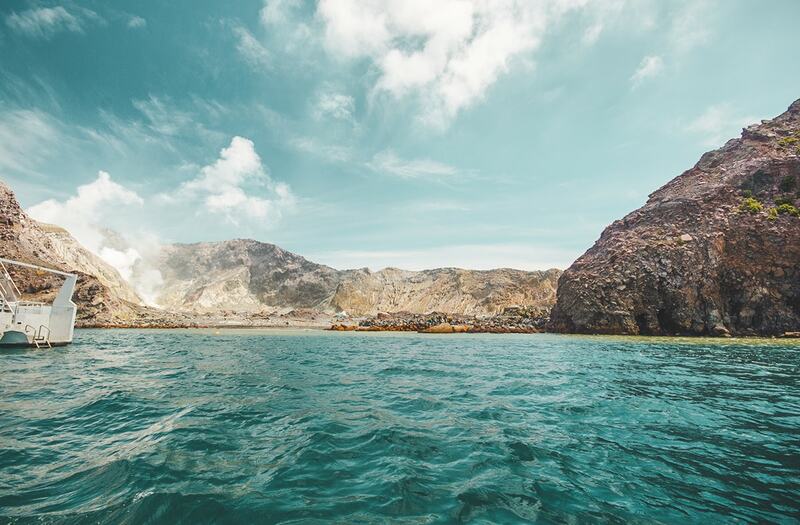 White Island is actually a private island and was declared as a private scenic reserve so you need special permission to land on the island. Though, authorized tour companies in the area run regular day trips to explore this magnificent place. 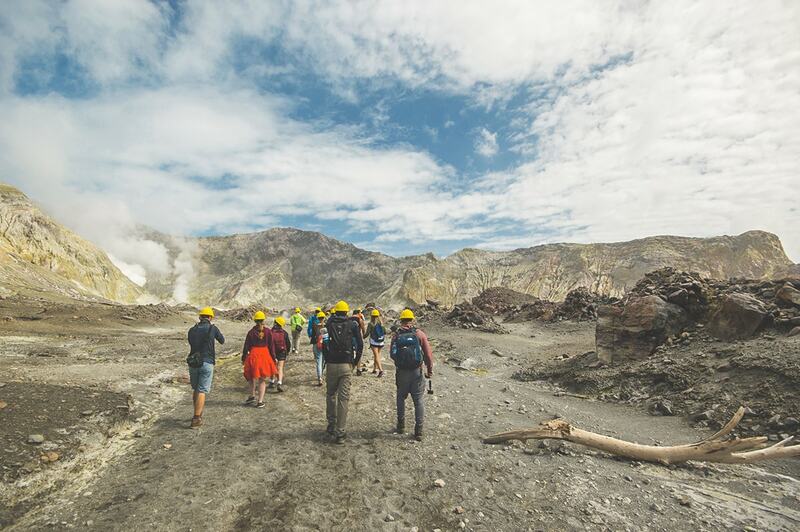 Allowing like-minded tourists and locals the opportunity to explore the out of this world landscape of White Island which should certainly be added to your NZ bucketlist! 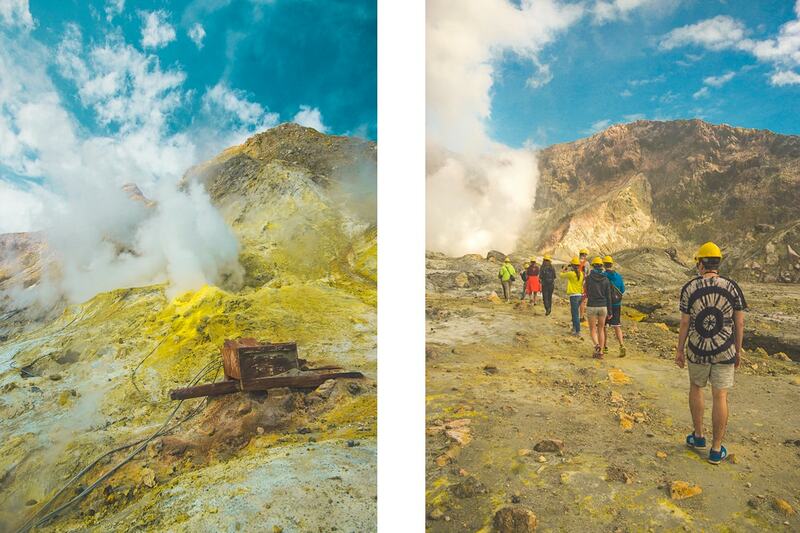 I decided to book with White Island Tours for our visit. 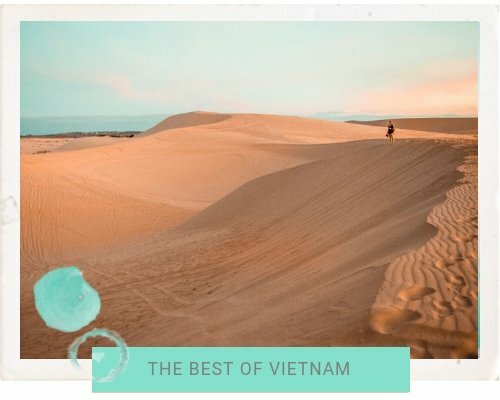 They are the main tour provider for the island and also have great knowledge of its history, the surrounding area and most importantly, know how to keep visitors safe. 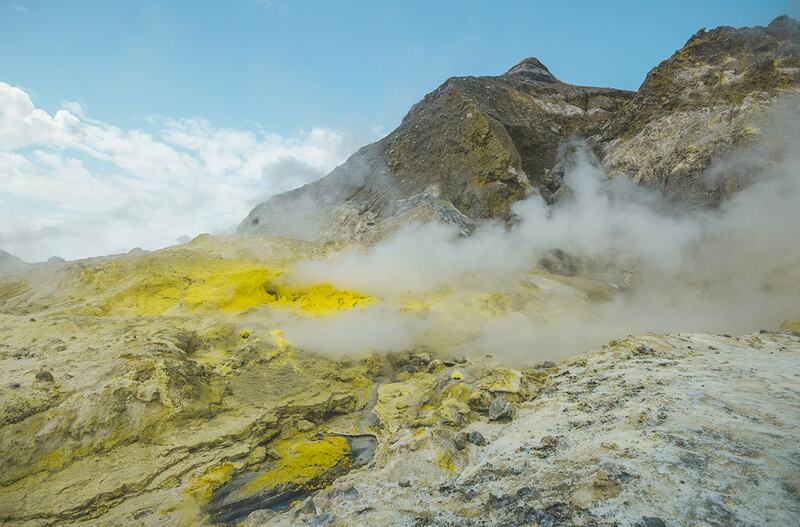 There is also the option to explore White Island by a helicopter tour, though our budget did not stretch that far. 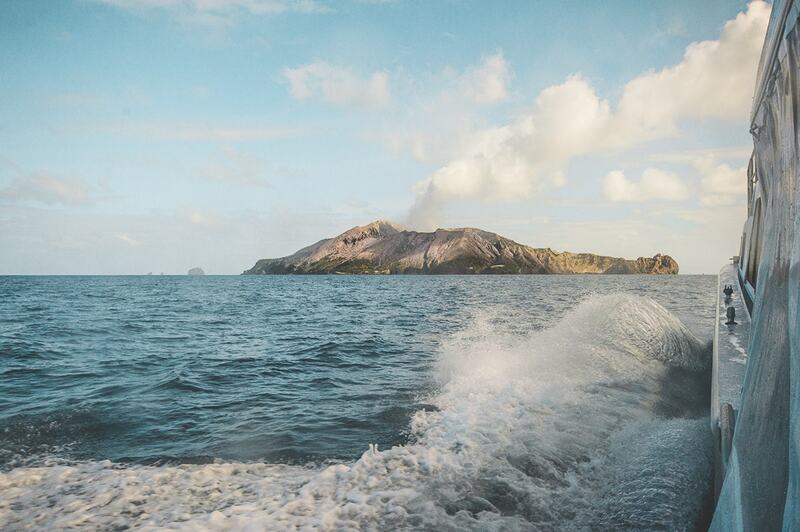 White Island Tours also operates its own accommodation called White Island Rendezvous. There are numerous room options to choose from and it is in the same location as where the tours depart from. Since I was booking the tour about a week in advance my budget accommodation options were limited. So I decided to book at White Island Rendezvous. Also if you book an accommodation and tour package they will provide a discount, just check out the deal options on their website. Finishing another day at work James and I jump in his car and drive towards the east coast to Whakatane. The trip takes longer than expected as we have to backtrack an hour in and take a detour thanks to a road closure. It’s a beautiful drive surrounded by rivers, pine trees and quiet highways. Nothing else is really towards the direction of Whakatane, as its not considered a tourist town. This prevents us getting slowed down by the regular camper van occurrences on the popular New Zealand road trip routes. Arriving at the White Island Rendezvous we check in easily and settle into our room. Being only a short walk from the harbor and town we decide to go for a walk and explore the area before it gets dark. The harbor is lit beautifully with the sun setting for the day. The boats moored up and the seagulls in search for their dinner. Its time for our dinner as well so we decide to walk a couple minutes into town and splurge on our favorite thing, Indian Food. Though, with a room booked and after working all day we head back to eat and chill out watching tv. Waking up early to check in for the tour they take our names and we are given a contract to sign. All the formalities are sorted and while everyone does that we head next door to the cafe on site. 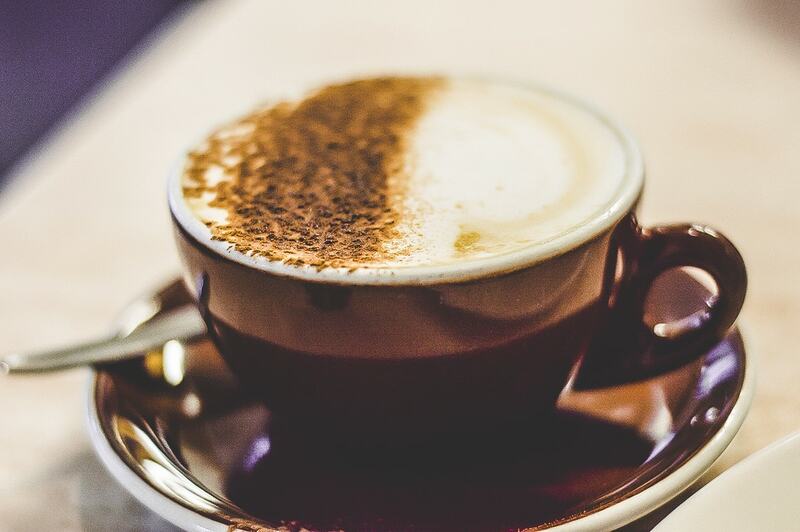 We relax and enjoy a delicious breakfast of coffee and a danish before heading out for the day. Soon its time to head over to the launch and jump on board. It is absolutely massive and with plenty of seating for everyone. The trip to the island takes a while seeing as it is 49 kilometers from the coast. Though, during the trip we are given helmets to protect our heads in case of any falling rocks as well as a gas mask as the sluphur fumes are so strong it will makes breathing extremely difficult. As we head further from shore the coastline disappears into the distance until there is nothing but ocean surrounding us. 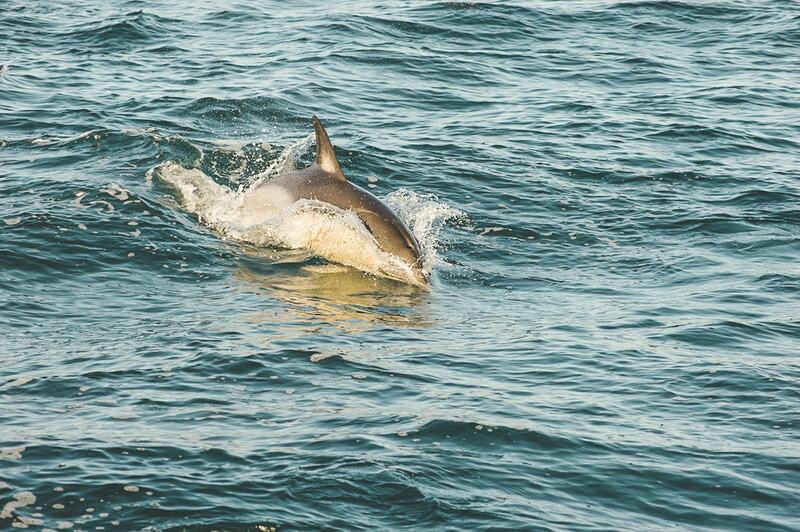 Though somehow friendly dolphins emerge from the depth and play alongside the boat perfectly jumping out of the water. We slow down a little and they easily match the speed of the boat gliding through the water. Everyone’s cameras are going off and mine is no exception. It is the first magical moment and there would be plenty more during the day. With the island approaching in the distance it is everything I have ever seen in in photographs. 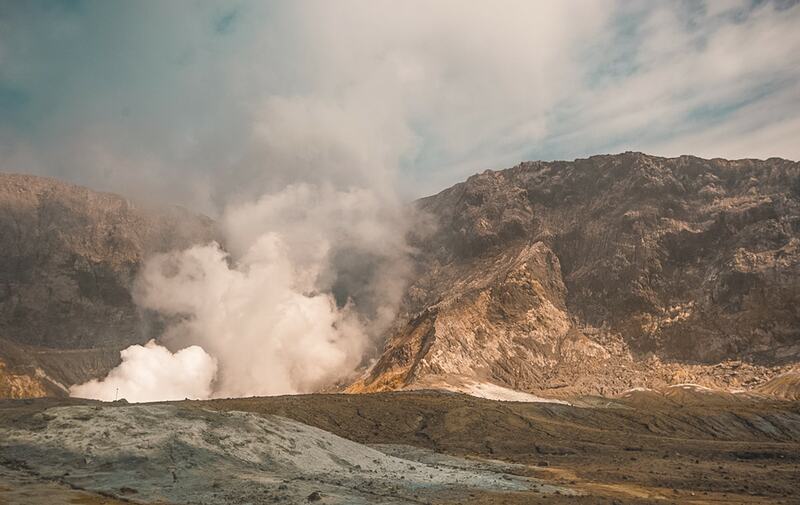 With deep blue waters, a barren island and heavy smoke rising into the sky; a easily recognizable site. Closer to the island the water changes to a lighter milky sort of color. The bright yellow and orange patches become more noticeable on the landscape also. A zodiac boat is released into the water which bring us to the island. 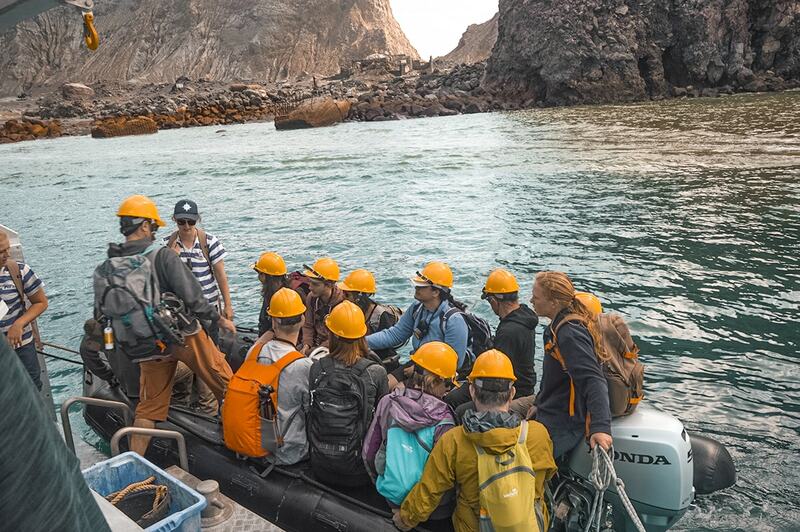 A rocky wharf jets out into the water and we climb up wooden planks and make our first step onto White Island. With helmets on and gas masks strapped around our necks we split off into groups and are given lollies to provide relief against the strong sulphur. 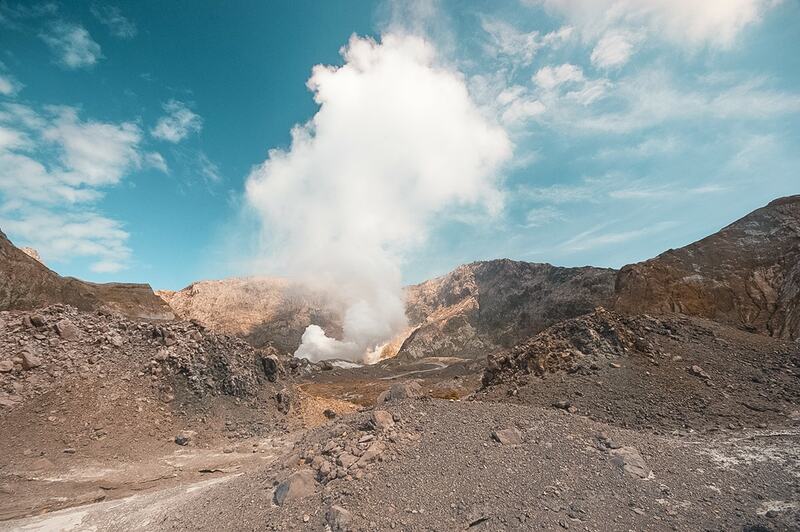 I am use to the rotten egg smell of Rotorua and have been visiting there for years. 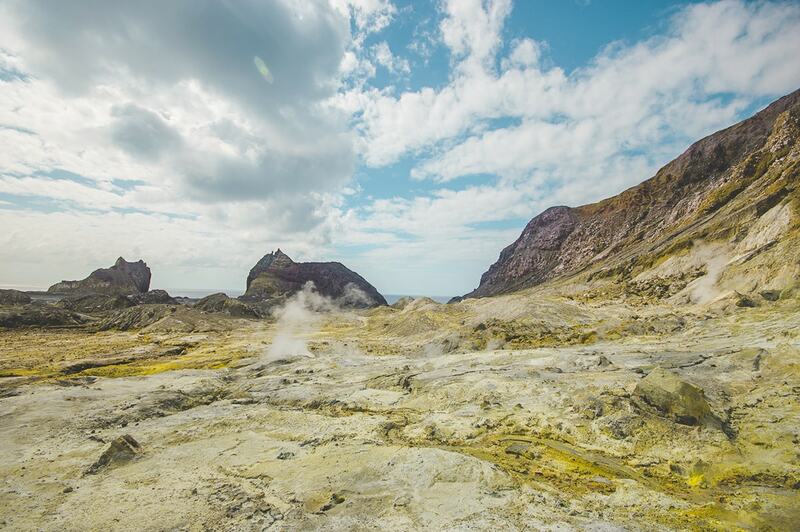 To my surprise, I felt as though White Island was on the same smelly level. I was honestly expecting it to be worse. The rocky terrain stretches throughout the entire interior of the island with paths made by the tour companies to follow. We are instructed not to go off the track for our safety. Though, they give us the crazy opportunity to taste the water from a small stream. I politely decline and by the disgusted looks of those who accepted, I made the right decision. Along the stream are where a lot of the orange the bright yellow material congregate. 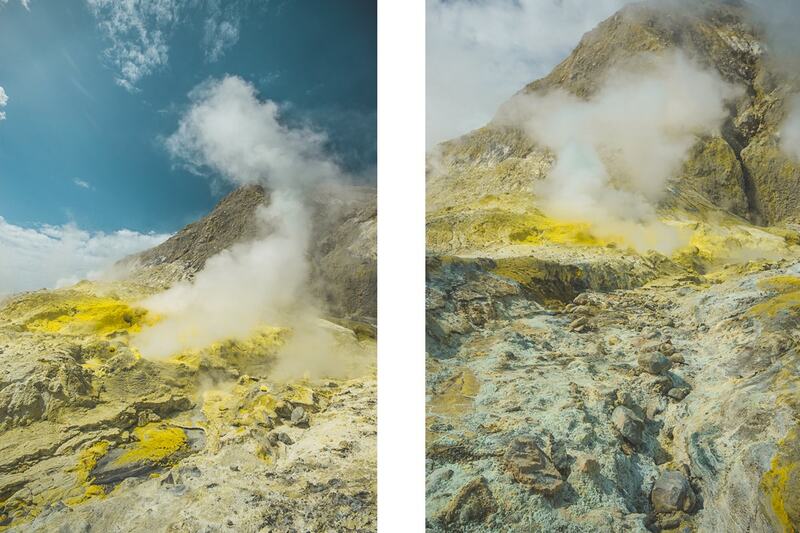 I am by no means a science orientated person, but I am going to assume it’s the sulphur reacting with the environment. We make our way further up a steady slope and more inland. The crater walls standing high above us with impressive canyons and impressions deeply lining them. Its difficult to tell how high up these cliffs are. Usually you would have trees or buildings to assist your brain in working out perspective. Though, apart from the rocks scattered around the landscape is barren. We arrive at a vent heavily producing a cloud of smoke into the air. Remains of the old sulphur mine dot the location, heavily rusted and worn. Suddenly the wind changes direction and this massive smoke cloud covers our group. It is so difficult to breathe. Even when sucking on the lollies to produce extra saliva to help break down the sulphur we are breathing in. I put up the gas mask up to my face and take in a few breaths. It honestly makes such a difference. 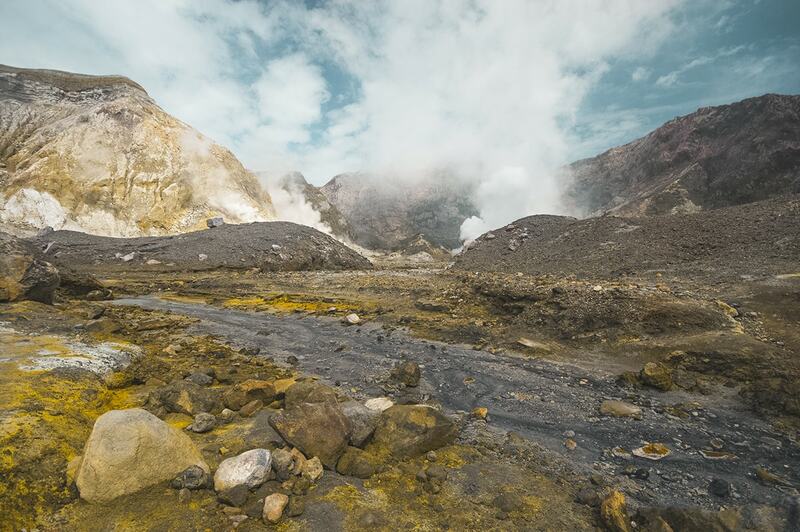 Further up the track we are at the main activity spot of White Island, the massive crater. Our tour guide tells us that the terrain is always changing. Sometimes there is water in the carter lake and other times its drained away or is evaporated. The whole landscape of the crater use to be a lot different we are told, where you could walk around it. Then one day when the tour group arrived the sides had collapsed and completely altered the landscape. Following the path we are led back around to where we started. Here we are given time to explore the old sulphur factory. The walls are barely standing in place and structure only just visible having been beaten by the extreme conditions since it was abandoned in 1914. We spend about an hour and a half exploring the island. Its just crazy to think this is even earth. I have never seen such a dramatic landscape full of the brightest yellow and orange hues. Though, when its time to leave we climb back down the dodgy wharf, then the awaiting zodiac to takes us all back to the launch. 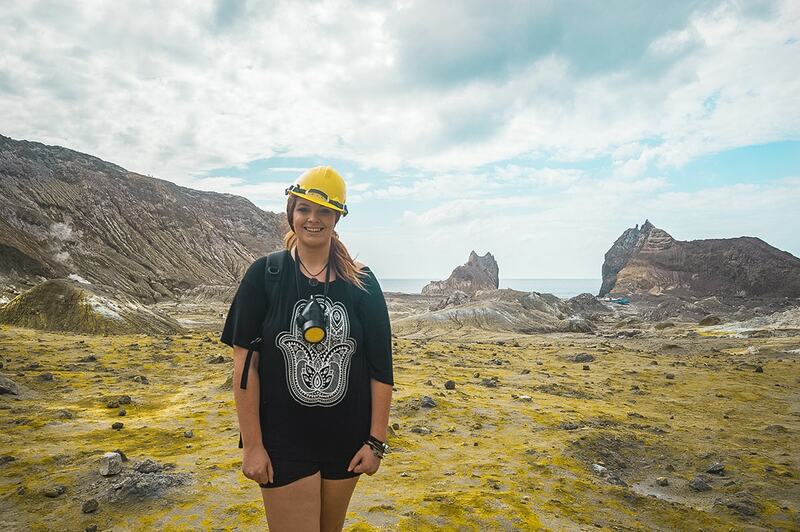 I honestly think White Island is one of the best experiences you can do in the North Island. 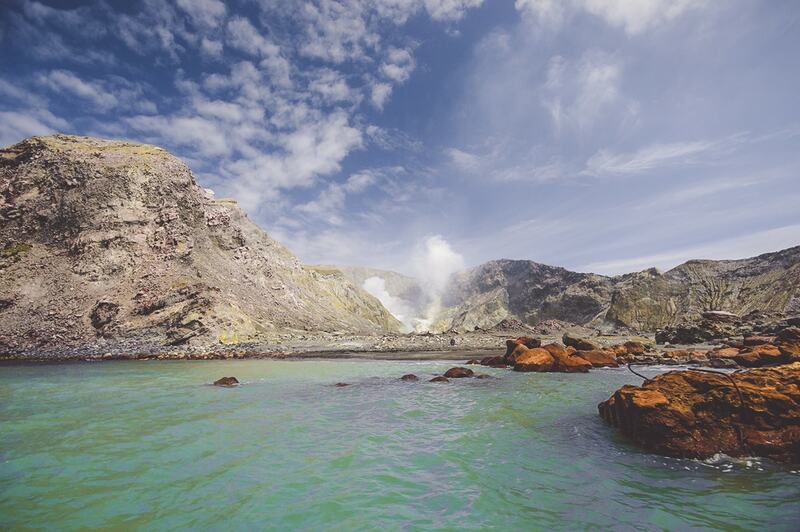 With a mind blowing landscape it should be on your list of places to visit in New Zealand. 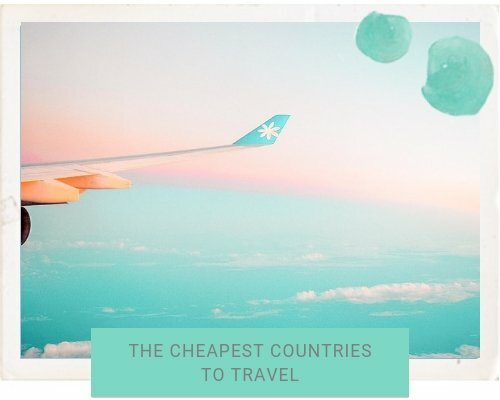 It may not be the cheapest experience if you are backpacking around New Zealand. Though, it is worth every dollar and you will not find any other place like it. 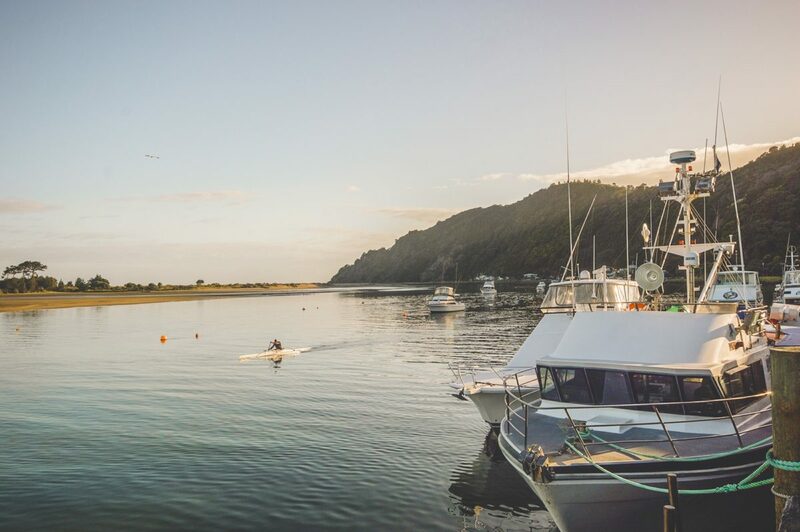 Even though Whakatane is not a commonly visited place for tourists, it makes a perfect overnight detour between Tauranga and Rotorua. This honestly looks amazing. 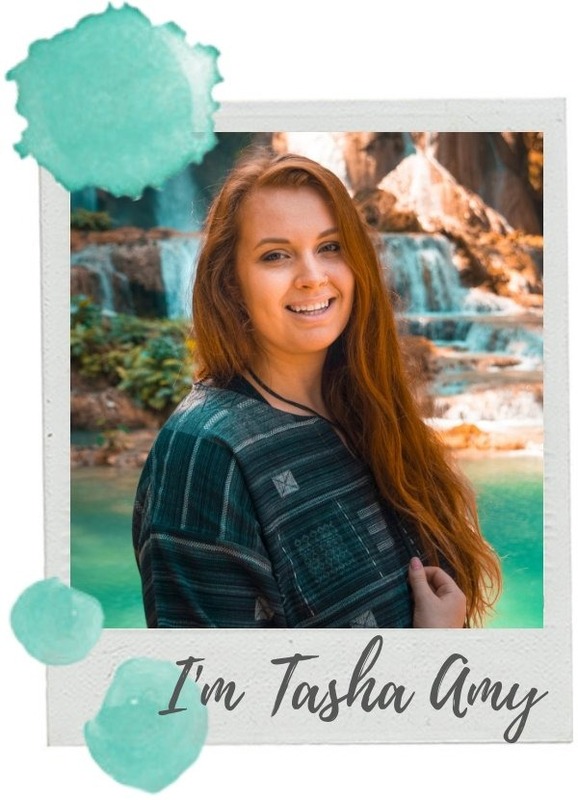 I had never heard of this place before but your beautiful photography has more than convinced me I need to go when I finally make it back to New Zealand. 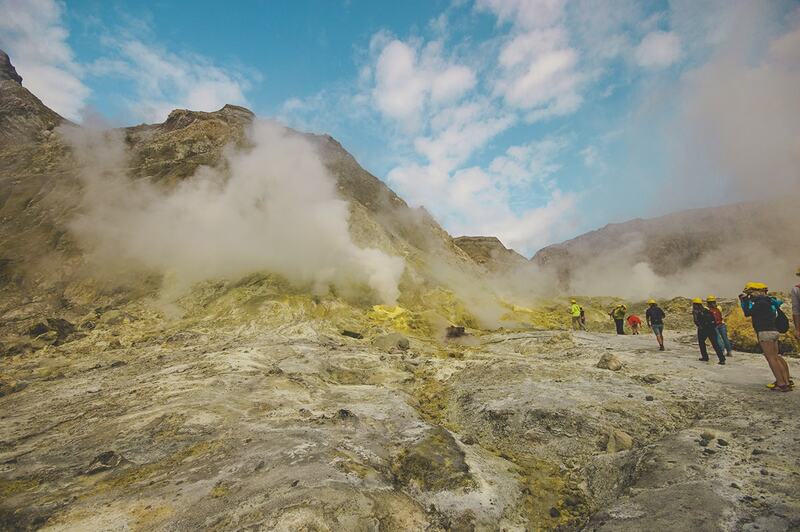 Totally adding White Island to my must do list for NZ! Although I’m born sure how I will handle the sulfur smell haha. I can’t wait to visit and might pick your brain for recommendations when I go! Great post! Beautiful photos! Looks like an awesome place to visit!! This sounds so wonderful! The shot from the on-site cafe looks so delicious! P.S. The way you described the experience is almost cinematic (I really want to visit now). What an exciting experience! This is something I really want to experience when I go to New Zealand. Thank you for sharing! Your photos are very beautiful. I need to go to New Zealand! Incredible. What an otherworldly landscape! This looks like such a cool (if smelly) activity. I love especially that it’s not on the usual tourist path! This looks like a great experience! Thanks for sharing your advice. I want to explore more of the North island! Yeah you must! Its amazing and slowly becoming more popular! haha its unlike any other place I have been, totally add it to your bucket list! You saw dolphins!! My family has bach over looking white island yet I have never done this trip. One day… 🙂 Looks incredible! Wow I’m so gutted I didn’t go there now. What a fabulous experience. Such beautiful pictures!! Aldo super jel you get to call Taupo home! This place blew my mind! First time I hear about it and I am glad I did. It looks so extreme. You have illustrated the place in an incredible way. Thanks! Its an awesome place to visit! This volcano is absolutely stunning! It looks like such a fun adventure! 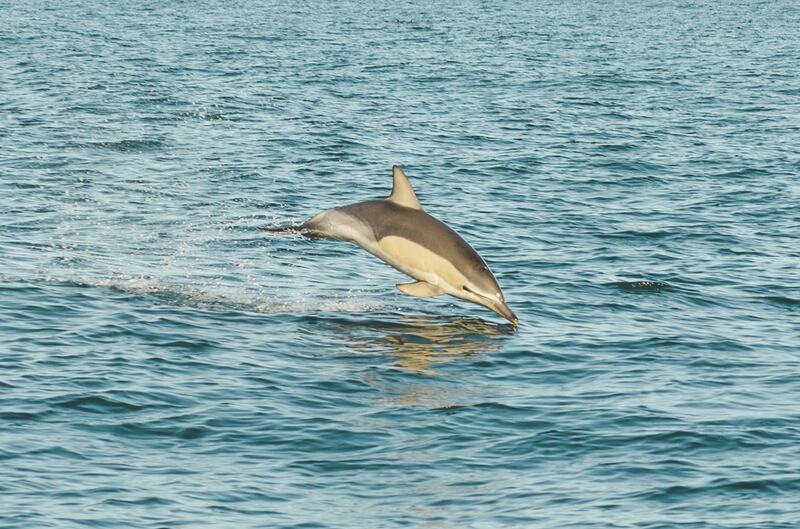 And how neat it’d be to see those dolphins in the wild! Its certainly an amazing experience! Beautiful photos! What a pitty we didn’t make it to the volcano when we were in NZ in March! 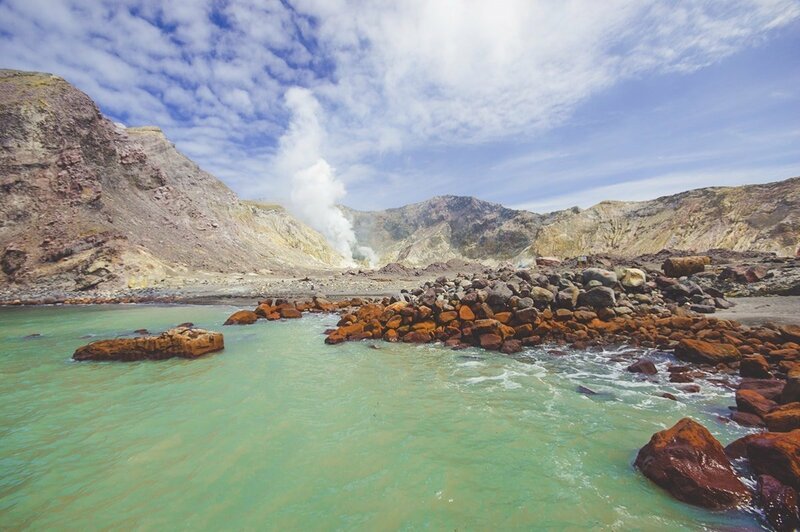 I’m really looking forward to visiting White Island, NZ really is the best! The place looks really fantastic and your pictures did justice to the landscape. Great post. first of all , your photos are gorgeous. 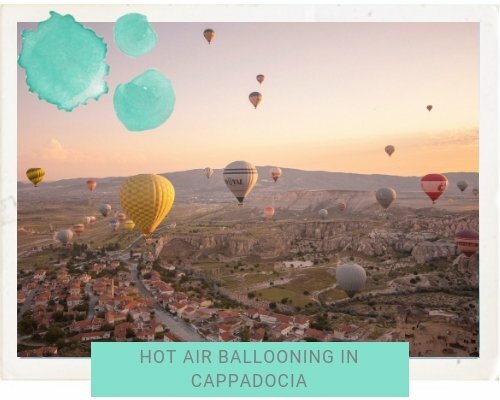 i am not sure i am going to do the same activity if i am around the area but it really looks exciting and that you had a great time! Oh interesting! I am dying to experience Indonesia! I have been to Jakarta but want to explore more of the country. Imagine seeing it blue at night, that would be amazing! eeee! i’m looking for things to do when I head to NZ next year! pinning this!! I didn’t know this was on my bucket list until I read this! this looks like so much fun!! Its an awesome place to visit! Whoa this is so cool! Now I’m disappointed I didn’t do this when i was in NZ. I think I’m going to have to go back and do everything I missed out on LOL! Yeah I live a few hours away and didnt know it was an options until I looked into it!